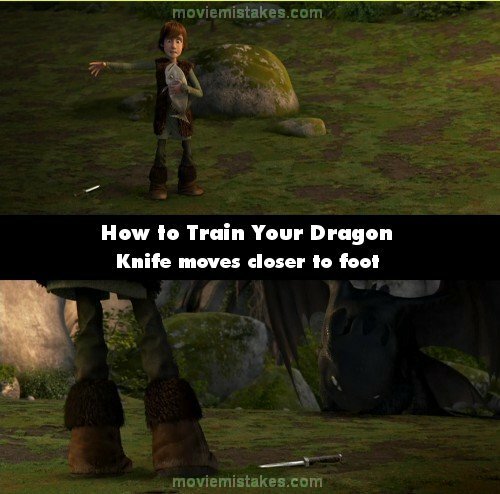 Continuity mistake: In the scene where Hiccup is in the woods looking for the downed Night Fury, right after he says "Not me, I manage to lose an entire dragon!" he hits a tree branch right in front of him and it comes back and smacks him in the face. In the next shot the branch is nowhere to be seen. Revealing mistake: In the beginning scene when the dragons are attacking Berk, it shows several sky torch things being raised into the air. As one closest to the camera is rising, a Viking throws a burning stick at it to ignite it. If you watch it closely, you can see the torch starts burning first to the far left, well out of reach of the thrown fire. Even allowing for fumes igniting, the fumes nearest the flame should light first. Continuity mistake: When Toothless flies away with Astrid and Hiccup for the first time, he plunges into the sea completely multiple times but none of them are wet afterwards. Continuity mistake: After the Gronckle regurgitates out the fish, its legs are altogether. But in the next shot, the Gronckle's right leg is seen scratching its neck. Stoick: When we crack this mountain, all hell is going to break loose. Gobber: In my undies. Good thing I brought extras. 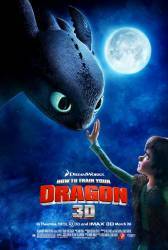 If you look closely at Toothless, you can see he has scars from the "mangler" Hiccup uses to shoot him down. They are located on his throat, left foot, and wing.